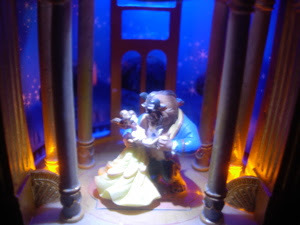 This is the "Gallery of Light" , a special light box created by master Disney miniaturist, Robert Olszewski. 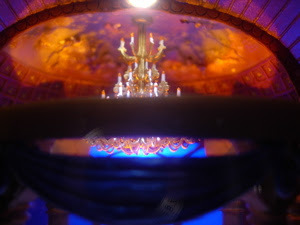 His work is very detailed, as you can see from these photos (look at that ceiling). This light box is so beautiful, it is one of my favorite things that I've bought in a long time. 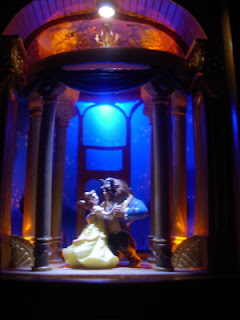 I can just sit and stare at this thing for a while- a colorful framed moment from the motion picture, "Beauty and the Beast", with Belle and the Beast dancing in a memorable scene from the movie. I actually now have a store on Ebay, Babycito-Disneyana, and I offer this piece for sale on my website, brand-new and in the box. 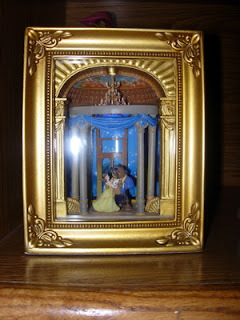 This piece is currently sold only at Disney Theme Parks in California and Florida, and is a best bet for gift-givers.